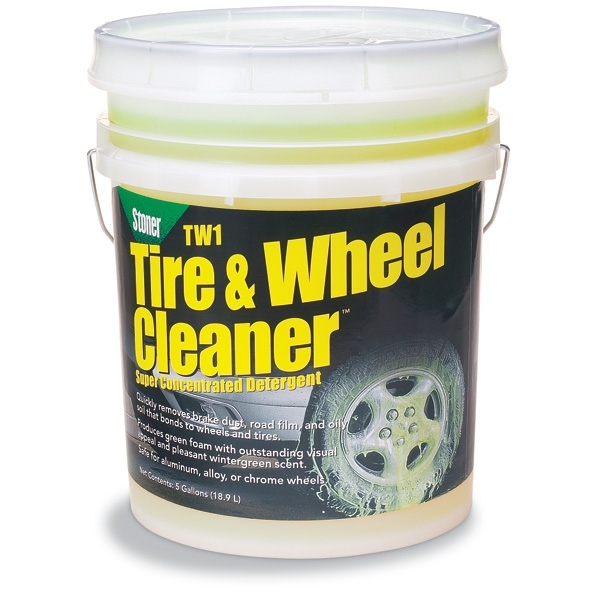 Stoner TW1 Tire & Wheel Cleaner - 5 gal. Stoner TW1 Tire & Wheel Cleaner is a super concentrated, non-caustic film fighting formula that quickly loosens and removes brake dust, road film, and oily road soil that bonds to wheels and tires. TW1's fast acting solvents penetrate and break the bonds holding brake dust to wheels, rims, whitewalls and tires. Stoner TW1 can be applied manually in self-service car washes or prior to tunnel entry in rollovers or any automatic car wash. Stoner TW1 is powerful enough to be used as an engine cleaner and versatile enough to be used in low pressure spray wands, foamer units, and manual brush applications. TW1 produces a visually appealing, bright green foam and leaves a pleasant wintergreen scent throughout the wash bay. Rinses freely and completely to help prevent streaking. Super concentrated for economy and cost effectiveness. Hard water tolerant. Contains no phosphates, caustics, acids or petroleum solvents. Contains no silicone wetting agents. Stoner TW1's acid-free formula is safe for aluminum, alloy, or chrome wheels when used as directed. Stoner TW1 Tire & Wheel Cleaner is concentrated for dilution with water only. When used directly from the container, start by diluting at 1:15 (TW1:water). Stoner TW1 may also be diluted with 2 parts water for use through a compressed air unit which will dilute at 1:4 or 1:5. Test mixture and adjust dilution, if necessary, for desired thickness and cleaning strength.